M. volans, similar to the spiders discovered in Western Australia. 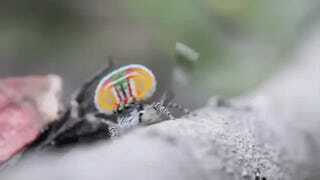 Most people wouldn’t describe spiders as “beautiful.” But have you ever seen a peacock spider? Scientists just found seven new species of these exotic, multi-colored arachnids. Australian scientist Jürgen Otto, known on YouTube as Peacockspiderman, found all seven species along the coast of Western Australia with help of Australian naturalist David Knowles and American spider expert David Hill. Although these species are only 4mm in size, they still have the same dazzling color display as other creatures that share the Maratus genus. Here are a few images from Otto’s recent study in Peckhamia, an international journal for jumping spider researchers (which is a truly wonderful thing that exists). These new discoveries bring the total peacock spider family to 48 with 16 more awaiting classification, so even more colorful strutting arachnids are on their way.